Navid Farzadfar, DDS (you can call him “Dr. Navid!”) is a general dentist with vast experience in root canal therapy, implant and cosmetic dentistry. He took over Redmond Family Smiles from Dr. Adam Jury in January 2017. Dr. Navid’s mission is to provide patients with the same dental care as he would deliver to his family members. He and his team aim at addressing patients’ chief concerns and tailoring the treatment plan based on each individual’s needs. Dr. Navid has experience with many areas of dentistry including Root canal therapy, gum disease, restorative dentistry, cosmetics, wisdom tooth removal, and implant placement and restoration. After graduating from dental school in 2008, Dr. Navid also completed one year of training in TMJ disorders and sleep apnea at UCLA as well as two and a half years of research fellowship and residency in general dentistry at the University of Rochester, NY. He is a faculty member at the department of restorative dentistry at University of Washington dental school. 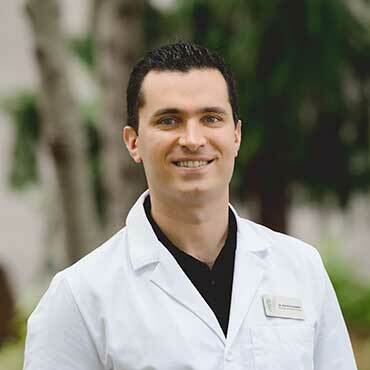 Dr. Navid has lived in California and upstate New York before he and his wife, Sepi, chose to move to the Northwest for his wife to pursue her education in Orthodontics. Here, he met Dr. Adam Jury who was looking for a dentist to take over his practice in order for him to move to Colorado to be closer to family. After spending several hours discussing numerous cases and ensuring that they share a similar vision in dentistry, he took over Redmond Family Smiles in January 2017. Dr. Navid enjoys calling the Northwest his home and is proud to be a member of the local community. Dr. Navid and his wife, Sepi, currently reside in Seattle and both enjoy the outdoor activities tremendously; their hobbies include hiking, movies, traveling and cooking. Although these hobbies occupy his time outside of the practice of dentistry, he can always be reached in an emergency situation.